Additional Info: A British Overseas Territory consisting of two groups of 40 tropical islands in the West Indies. Bordering the edges of the islands are lines of coral reef and some of the most impressive walls of coral in the Caribbean. 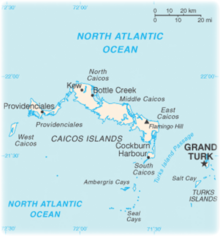 The Turks and Caicos Islands (TCI) are a British Overseas Territory consisting of two groups of tropical islands in the West Indies. The two island groups are in the Atlantic, southeast of the Bahamas, north of Hispaniola, and 494 n-miles from Miami. The eight main islands and more than 20 smaller islands have a total land area of 238 sq. miles, primarily of low, flat limestone with extensive marshes and mangrove swamps and 230 mi of beach front. TCI rests behind the forth longest barrier reef in the world. One of the most extensive coral reef systems surrounds the islands, making it one of the most popular dive locations in the world. It offers superb visibility (up to 200ft), beautiful looked after reefs, abundant marine life as well as being close to the beach. There is also a smattering of unique wreck dives for the more adventurous. Summer waters (82-84degF at the surface) are certainly warm enough for bathing suits; protection in the form of a light wet suit is welcomed by most divers. In the winter, water temperatures of 74-78degF would suggest the use of a 2-3mm wetsuit. » Elephant Ear Canyon (50-100ft) - A cut in the top of the reef wall descends through a series of sand gullies to an area of large coral buttresses. The largest elephant ear sponge in the TCI resides here, and is home to many interesting creatures, not least the myriad of crustaceans, gobies and other small fish that make it their home. Under the boat at the end of the dive, divers can see garden eels, stingrays, and tilefish. » Driveway (40-90ft) - From a reef you can swim down a long sand chute that stops at a ledge, covered in star and plate corals, from where the reef drops into the abyss. The wall is covered in black coral trees and red tube sponges. Beyond the ledge there are often sharks and large groupers. An excellent site for a night dive. » Shark Hotel - At the top of the Shark Hotel wall, divers find schools of grunts, snappers, and goatfish. The wall begins in about 45ft and drops straight down to 80-100ft where a plateau juts out and forms a shelf before plunging into the abyss. As the name suggests, this site is a good place to spot small reef sharks. Close to the mooring is a huge stand of pillar coral, some of the largest to be seen in the Turks and Caicos. » Black Coral Forest (45-200ft) - An overhung section of the reef wall, undercuts to about 80ft and then drops to a ledge at 200ft before falling away into the deep, this wall is covered with block coral trees of varying species. Find small chromis and other fish, seeking refuge amongst the branches. » The Dome/Thunderdome - A large domed metal structure with a door in the top and one in the side, inside the dome you can find snappers, chub, goatfish and occasionally barracuda. » The Crack (50-100ft) - A large fissure runs in an arc through the reef, and it can be exited at any point along its length. Starting at the reef top the crack extends down the reef slope to a wide sandy ledge. From here the wall drops away into the abyss. Half way down the crack you will find a massive barrel sponge and a beautiful anemone. The top of the reef is dominated by a large pillar coral formation around which you can often find swirling schools of grunts and snapper. » Double D, close to shore and guess what the two coral mounds resemble? Look out for the oversized scorpionfish that lives on the mounds. Beyond the coral mounds the wall slopes gently down into the depths, but coral growth here is exceptionally lush, with plate corals, pillar corals and large stands of seafans and soft corals. The sandy areas reflect the sun off the sea floor, so the area is particularly light. Conch Bar Caves National Park - This park protects 15 miles of underground caverns, one of the largest cave systems in the Caribbean region. Some have lagoons and stalactites and stalagmites and most have colonies of bats. They were used as sacred sanctuaries by the Lucayan Indians, who left petroglyphs on the walls. Grand Turk Cays Land and Sea National Park - among the uninhabited cays in the Grand Turk Cays Land and Sea National Park is Gibbs Cay, where you can swim in the shallow water with stingrays. West Caicos Marine National Park offers some of the most beautiful diving spots and is therefore one of the favorite destinations for the dive operators from Providenciales. From late December through April, the entire Atlantic herd of 2,500 Humpback Whales pass through the shores on their annual migration.